Yesterday was day 2 of the Salad A Day Challenge. Let’s just say I was very successful at stinking it up. I made a salad, I put dressing on it and then the smell of the dressing was a huge turn off so I threw it out. No picture, no eating, no nothing, just into the trash can it went. I instead ate a tuna sandwich (with onion, celery and tons of lettuce) and a bunch of grapes and cheese on the side. So yeah, didn’t even make it through day two. Ha! I did manage to at least get some fruits and veggies involved in what I did eat for lunch. Later I had Mu Shu Pork and wonton soup that was pretty much all cabbage for dinner. None of the rice or all that jazz with it though. Maybe today will be better and I get back to the challenge. Let’s see what else is going on. I still have that damn cramping from my accident with the dog, Spending the day in the hospital was not fun, but at least we know that the pain is just from bruising and nothing major. So I am peace of mind at least. I have been trying to go through Emma’s room and get it cleaned out and downsize how much stuff she has. It has become quite the chore to take on. Especially after some one else’s kid comes over and trashes it. I love when other kid’s parents refuse to have their kids pick up here like I am some sort of damn maid. 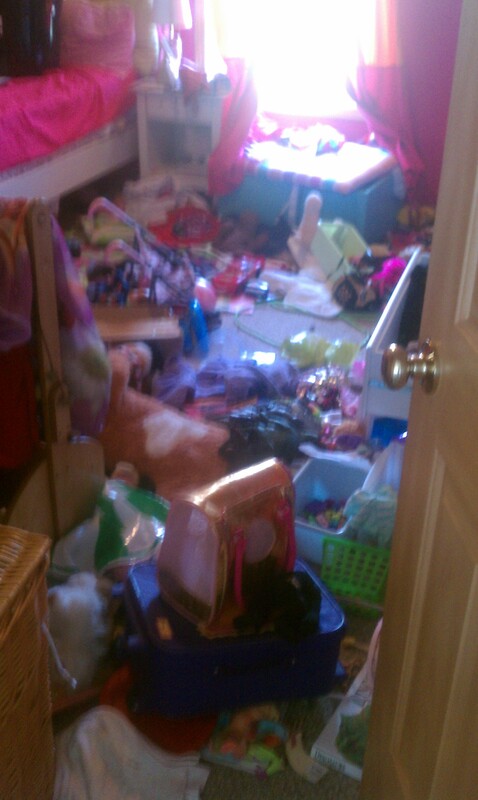 This is what condition her room was left in..
Let’s see what else there is… School shopping. We have most of it done but it is not finished. It is actually starting to irritate me a little I freak out when things are last-minute. There is not much else to buy. A few trivial things and black and brown dress shoes. More when there are more fall weather items in the stores (that does not freak me out though) I struggle with things that are not planned or at least at the minimal organized chaos. I like things planned out and done early on. Posted in Blogging, Family, Food, Health and Fitness, Life, Pregnancy, Uncategorized and tagged cleaning, food, freaking out, salad, school, shopping. Bookmark the permalink.